Whatever your objectives, knowing what different parts of forest diversity look like is a key step towards getting it. There are several key parts to diversity: those things that grow and live in a forest, how those things are arranged and when those things happen. Each is shaped or influenced by the physical environment (like soils or elevation) and natural processes (like competition, storms or fire). Many kinds of diversity can also be enriched by us. Probably the first thing people think about as diversity is the number and types of plants and animals in the forest. Certainly, what is growing in the forest (the species composition) is an important part of diversity. 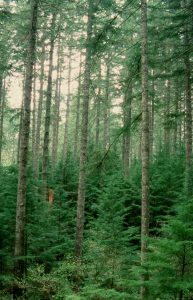 A mix of trees which includes cedar and maple along with Douglas-fir is more diverse than monocrop of Douglas-fir alone in the forest canopy. You can think of the different kinds of plants as the building blocks of a forest, or maybe better, ingredients in a recipe. An oatmeal raisin cookie is more diverse than an oatmeal cookie. But not twice as much. There are many ingredients in cookies that go unobserved or unseen. While trees are the most obvious and the defining elements of the forest (like the oatmeal and raisins), understory plants, soil microorganisms, fungi, and other elements play less glamorous but essential roles (like the flour, sugar and baking powder) in making the cookie a cookie. Another easily observed feature of diversity is the forest’s structure, or how things are arranged. Looking up and down you may see one or more layers of vegetation from the tree canopy to the leafy plants growing on the forest floor. Looking at these layers, you are looking at the vertical diversity. An Oreo cookie has more of it than our oatmeal cookie does. This structure affects how the woods look, but also how things work. Having more vertical diversity can be visually appealing. And because different animals use different parts of this vertical forest structure to forage, roost or nest, it may mean more types of animals using your woods too. Likewise, looking side to side we can see the texture of the forest (its horizontal diversity). The woods may be quite uniform throughout, with little difference from place to place. Or the woods may be uneven, with groups or patches of different things scattered about. These could be areas with different ages, sizes or species of trees. To picture this horizontal diversity, let’s think about cookies with a similar variety of ingredients but different horizontal structure: chocolate and chocolate chip. Chocolate cookies are uniform throughout, but chocolate chip cookies are patchy, and more diverse. Like vertical structure, this horizontal structure provides different conditions that may be visually appealing or suit different animals. Perhaps the least obvious part of woodland diversity is time, or perhaps better, processes that take time. It may be cheating a bit to include time as part of diversity, but as an observer of nature and care-taker of a woodland, it is important for you to recognize its impact on the different parts of diversity. Some kinds of diversity can happen quickly, others just take time to develop. Cookie dough is great, but it is not a cookie until it has spent some time in the oven. Imagine a riparian restoration plantation along a stream. You can quickly create species diversity by planting a mix of species, and horizontal diversity by planting patches of different trees or shrubs rather than blending them together. However, to get vertical diversity with layers including large trees (desired to shade more of the stream longer and/or have large logs to fall in the steam), you need decades, maybe even a century or more for that to fully develop. As a landowner, you have many opportunities (such as planting, controlling invasives or thinning) to shape your woodland property. Each is a choice between paths that take you to different destinations, with different outcomes, depending on the recipe you pick. We hope this introduction will help you choose your path.